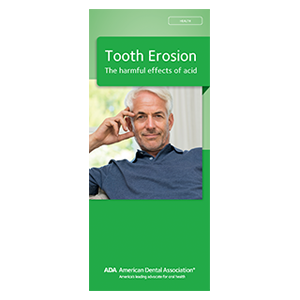 This new brochure topic explains why acid is a major cause of tooth erosion. Covers how erosion can occur from acidic drinks, acid reflux/GERD, eating disorders and dry mouth. Reviews what can happen to teeth if erosion is left unchecked, using real case examples to illustrate what it looks like and the damage it can cause. Explains the ways that erosion can be managed and prevented. 8 panels, pack of 50.